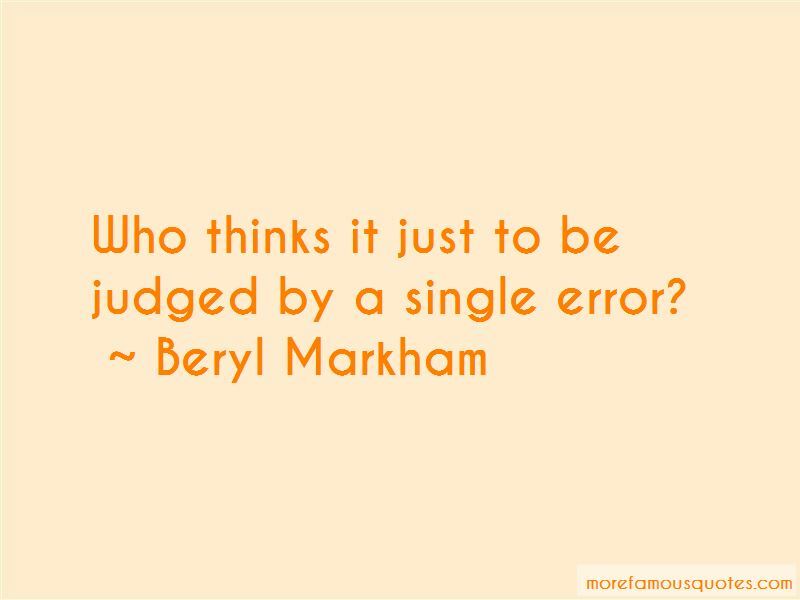 Enjoy the top 99 famous quotes, sayings and quotations by Beryl Markham. “A map says to you. and as many books about it as you could read in a leisurely lifetime. Whoever writes a new one can afford a certain complacency in the knowledge that his is a new picture agreeing with no one else's, but likely to be haugthily disagreed with by all those who believed in some other Africa ... Being thus all things to all authors, it follows, I suppose, that Africa must be all things to all readers. Talk lives in a man's head, but sometimes it is very lonely because in the heads of many men there is nothing to keep it company - and so talk goes out through the lips. [I]t is no good anticipating regrets. Every tomorrow ought not to resemble every yesterday. Denys (Finch-Hatton) has been written about before and he will be written about again. If someone has not already said it, someone will say that he was a great man who never achieved greatness, and this will not only be trite, but wrong; he was a great man who never achieved arrogance. (This place) presumed to be a town then, but was hardly more than a word under a tin roof. From the time I arrived in British East Africa at the indifferent age of four and went through the barefoot stage of early youth hunting wild pig with the Nandi, later training racehorses for a living, and still later scouting Tanganyika and the waterless bush country between the Tana and Athi Rivers, by aeroplane, for elephant, I remained so happily provincial I was unable to discuss the boredom of being alive with any intelligence until I had gone to London and lived there for a year. Boredom, like hookworm, is endemic. There is a legend that elephant dispose of their dead in secret burial grounds and that none of these has ever been discovered. In support of this, there is only the fact that the body of an elephant, unless he had been trapped or shot in his tracks, has rarely been found. What happens to the old and diseased? Not only natives, but many white settlers, have supported for years the legend (if it is a legend) that elephant will carry their wounded and their sick hundreds of miles, if necessary, to keep them out of the hands of their enemies. And it is said that elephant never forget (206). It was a world as old as Time, but as new as Creation's hour had left it. 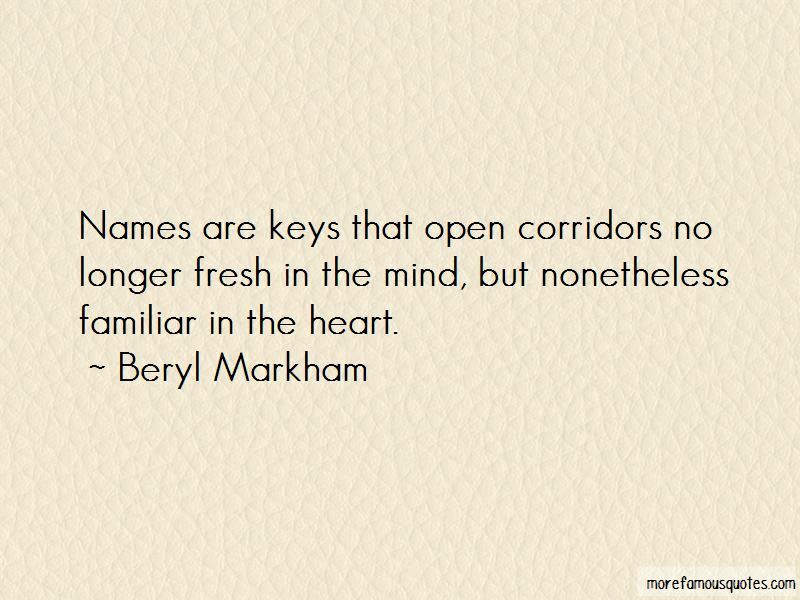 Names are keys that open corridors no longer fresh in the mind, but nonetheless familiar in the heart. I learned what every dreaming child needs to know, that no horizon is so far you cannot get above it or beyond it. Who thinks it just to be judged by a single error? The sun is as dispassionate as the hand of a man who greets you with his mind on other things. Life had a different shape; it had new branches and some of the old branches were dead. 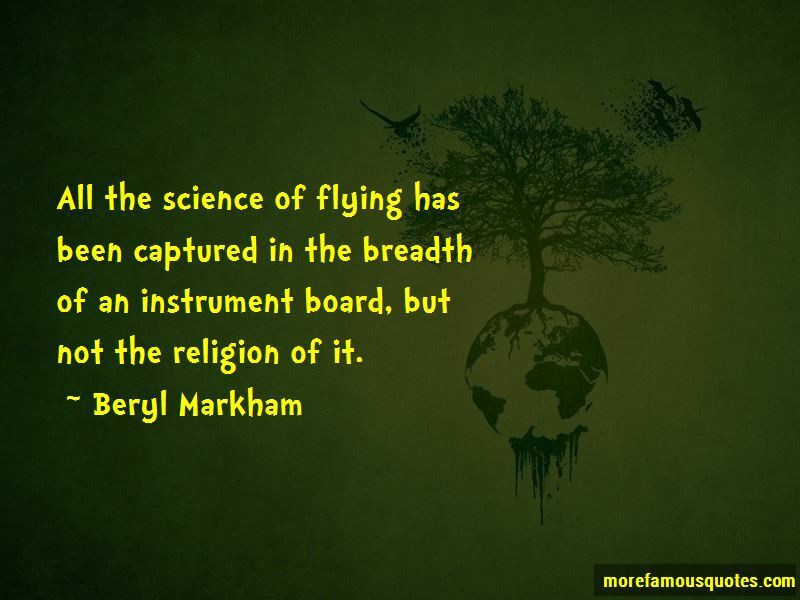 Want to see more pictures of Beryl Markham quotes? 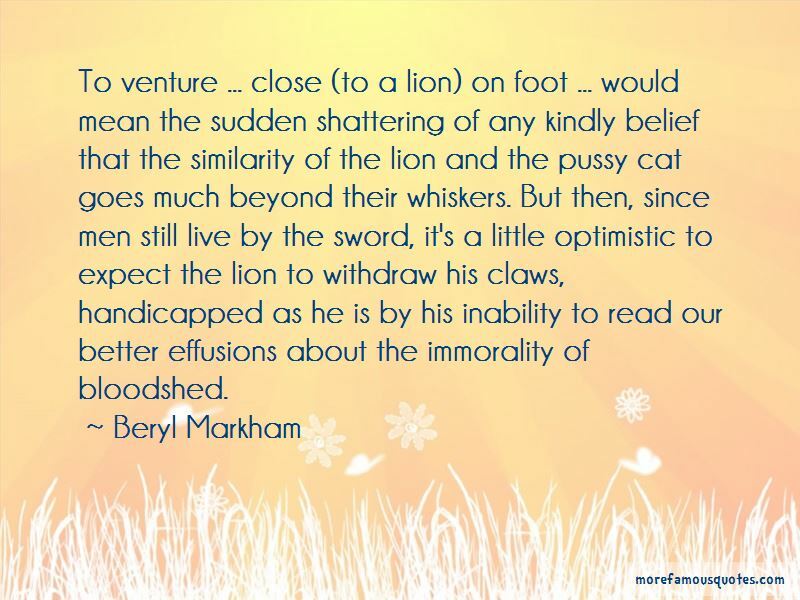 Click on image of Beryl Markham quotes to view full size.